Denon has announced the latest addition to the X-Series line of AVRs, the $999 AVR-X3500H, which will include support for Apply AirPlay 2, Amazon Alexa Voice Control, ihiji Invision, Domotz Pro, eARC, and Auto Low Latency Mode. The unit will also provide support for object-based sound formats, including Dolby Atmos, DTS:X and DTS Virtual:X processing, as well as advanced video processing capabilities. 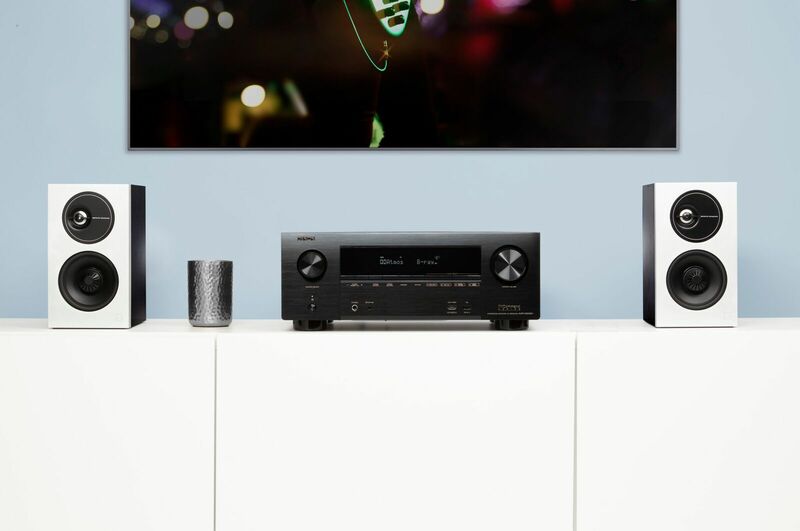 The latest X-Series receiver is enabled with Amazon Alexa voice control via the Smart Home Skill for Entertainment Devices, Apple AirPlay 2, eARC, and Auto Low Latency Mode (ALLM), to lessen any near-future possibility of obsolescence. The unit includes seven channels of power amplification rated at 105 watts per channel (8ohms, 20Hz-20kHz, 0.08% THD), whole-home wireless music via built-in HEOS multi-room tech, and Apple AirPlay 2 via future firmware update. Amazon’s Alexa Smart Home Skill for Entertainment Devices will allow consumers to use voice commands to control AVR functions, including power on/off, volume, mute/unmute, music play/pause, external input switching and playback of supported streaming services. For vinyl enthusiasts, the AVR-X3500H is also built with a phono input. An AKM 32-bit DAC permits the AVR-X3500H to decode ALAC, FLAC and WAV files at up to 24-bit/192-kHz and the AVR is also compatible with 2.8/5.6-MHz DSD files, which can be played from memory devices via the front panel USB, or over network sources. All eight HDMI inputs, and three HDMI outputs, feature HDCP 2.2 support, as well as 4K Ultra HD 60Hz video, 4:4:4 Pure Color sub sampling, Dolby Vision, High Dynamic Range (HDR10), Hybrid Log-Gamma (HLG), and BT.2020 pass-through support. It is also certified by the Imaging Science Foundation and features video calibration controls (for use by an ISF technician), along with ISF Day and ISF Night video modes. Denon will also unleash the support for two of the latest HDMI 2.1 features: eARC (Enhanced Audio Return Channel) and ALLM (Auto Low Latency Mode) via future firmware update. eARC supports uncompressed object-based audio from TV applications (a feature exclusive to the HDMI 2.1 spec), while ALLM ensures Xbox One users have a more responsive gaming experience when connected with a TV model that also supports ALLM. The AVR-X3500H features compatibility with ihiji Invision and Domotz Pro remote monitoring and management technologies. Both tools give custom integrators the ability to remotely monitor AVRs and provide fast assistance to clients from any location. External and IP control capabilities provide customization and compatibility with third-party solutions. SDDP (Simple Device Detection Protocol) certification integration with Control4 home automation equipment can also help setup. Additionally, with embedded Crestron Connected technology, the AVR-X3500H communicates with Crestron home automation solutions. The AVR-X3500H ($999) is currently available via authorized Denon retailers. For more information, visit www.usa.denon.com/us.